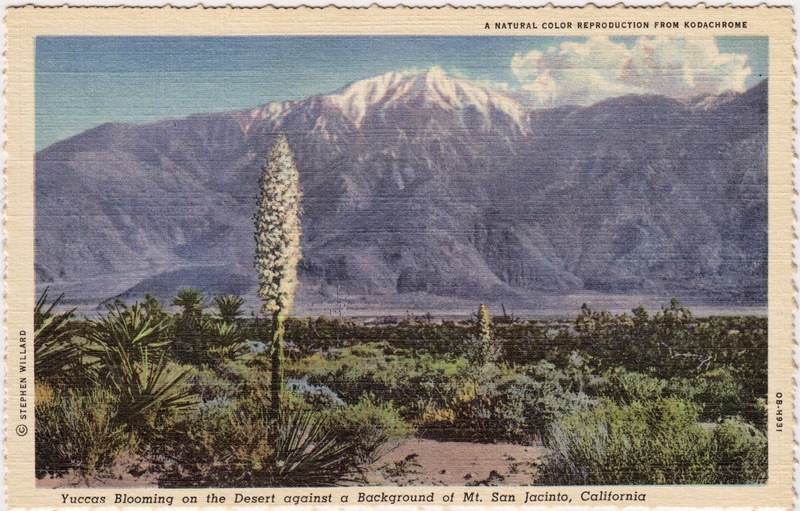 Postcard US-3285001 to Finland was a vintage linen card Yucca Whipplei blooming with a background of mighty San Jacinto Mountain in California. Native to southern California, United States and Baja California, Mexico, Yucca whipplei ( Hesperoyucca whipplei) is a species of flowering plant in the genus Hesperoyucca, but closely related to, and previously usually included in, the genus Yucca. It is extremely drought tolerant and thrives in clay soils. The fiber from its leaves was used extensively by Native Americans for making sandal, cloth, and rope.